So many events, so little time! Here’s a round up of some the coolest happenings around Miami this week. On Wednesday, November 14th two of Miami’s most celebrated restaurants of the moment, Pao and KYU. KYU Chefs Michael Lewis and Raheem Sealy have teamed up with Pao’s Chefs Paul Qui and Benjamin Murray for a dynamic collection of Asian-inspired dishes, featuring KYU’s signature wood-fire cooking alongside Pao’s inventive ingredient pairings. The dinner will be hosted at KYU and feature a prix fix menu, inclusive of a signature cocktail. Brickell’s favorite happy hour is turning back its prices! Starting this Friday, November 2nd and every Friday through the fall season, the after-work party begins at 5PM on the 16th floor of Kimpton EPIC Hotel with panoramic views of Downtown Miami and the Miami River. During the rooftop’s already popular Friday Social Hour, guests will enjoy $7 cocktails all night including single mixed select drinks, house red, white wines and prosecco. Area 31’s executive chef Alex Olivier will also offer $8 bar bites such as ceviche clasico, pork belly steamed bun, goat cheese croquettes and Parmesan truffle fries, as well as occasional poolside grill specials. Kimpton EPIC’s resident DJ Kristian Caro provides the rooftop party vibes, spinning soulful beats with occasional live musical guests. Poolside cabana rentals are available. Area 31 is located on the sixteenth floor of Kimpton EPIC Hotel, 270 Biscayne Blvd. Way, in downtown Miami. For reservations, call 305-424-5234. Minnow Bar, the Washington Avenue clear spirits cocktail den, launched its weekend Deep Blue Debut, a unique and savory lite bites menu from the upcoming Seawell Fish n’ Oyster. 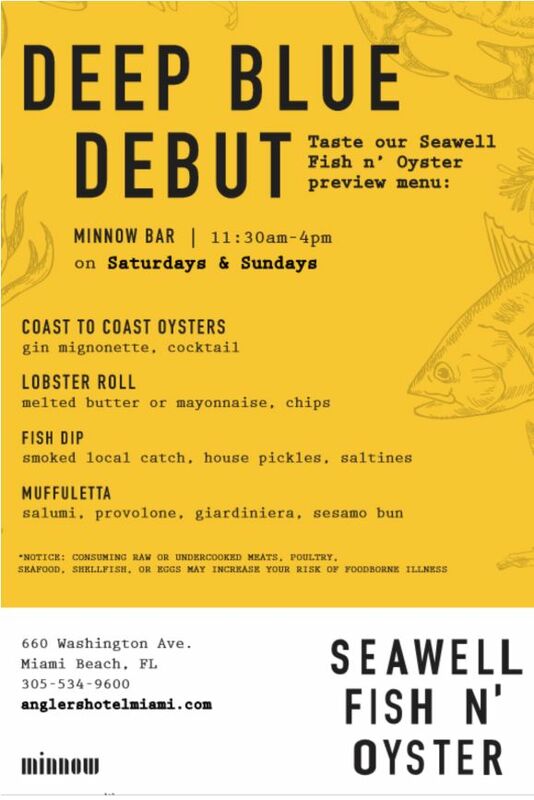 Developed by Seawell’s executive chef Julian Garriga, Deep Blue Debut is a preview of the upcoming coastal American seafare restaurant and a great compliment to the gin house’s herb-infused craft cocktail menu. Available on Saturdays and Sundays from 11:30AM to 4PM, Deep Blue Debut features some of Garriga’s soon-to-be favorites such as $1 coast to coast oysters, Seawell’s signature lobster roll served with choice of melted butter or mayonnaise and chips, smoked local catch fish dip with house pickles and saltines and the decadent muffuletta on a sesamo bun with salumi, provolone and giardiniera. Minnow Bar’s unique clear spirits menu is available during Deep Blue Debut including favorites such as Sea Level, Hey Roxy and Rey Mambo. With over a decade of South Florida culinary expertise, executive chef Julian Garriga will lead the culinary program at Seawell Fish n’ Oyster with his energetic approach in the kitchen and his appreciation for local flavors. 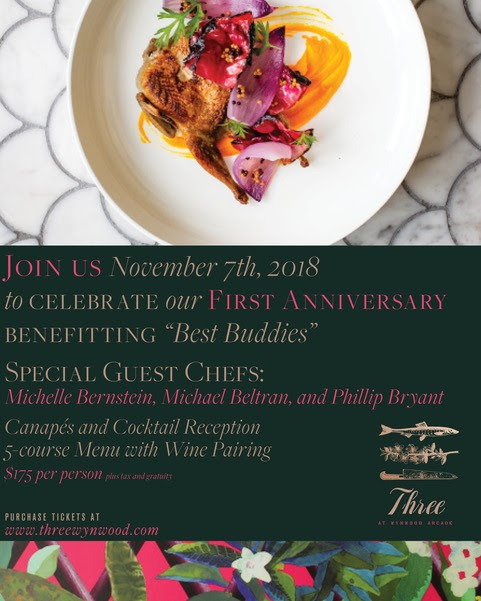 Chef Garriga’s menu will highlight tried-and-true classics alongside entrée selections that play with finfish, shellfish and non-seafood items, offering a broad range of flavors that will appeal to all palates. Recently crowned the winner of the Battle: Fish at this year’s South Beach Seafood Festival, Chef Julian will run his winning dish during upcoming Deep Blue Debut weekends. A complete reimagining of the former 660 at Angler’s, Seawell Fish n’ Oyster will debut in late fall 2018, serving coastal fare through raw bar, fresh fish and shellfish selections. Balancing between rustic and refined, Seawell will exude sophistication in a relaxed, nautical-designed dining room. The Miami Beach EDITION is bringing back Pineapples & Pizza at Matador Bar on Thursday, November 8. The popular pizza party will feature live music by Eli La O, Matador Bar's resident Saturday DJ. Guests can indulge on the specialty pizza of the night, Beef Carpaccio Pizza topped with mushroom, arugula and parmesan and sip on the Absolut Elyx Pineapple cocktail for $35. For the month of November, Brimstone Restaurant Group will be giving back to Veterans in need. All locations will be holding a Veterans donations drive throughout the entire month and will be accepting clothing, hygiene items, books, and household items. Guests who donate will receive a drink ticket for a complimentary drink. On Veterans Day, Brimstone Restaurant Group locations; Beach House Pompano and Brimstone Woodfire Grill, in Pembroke Pines and Doral will be offering free lunch [Up to a $20 value] to Veterans and active duty soldiers with valid I.D. 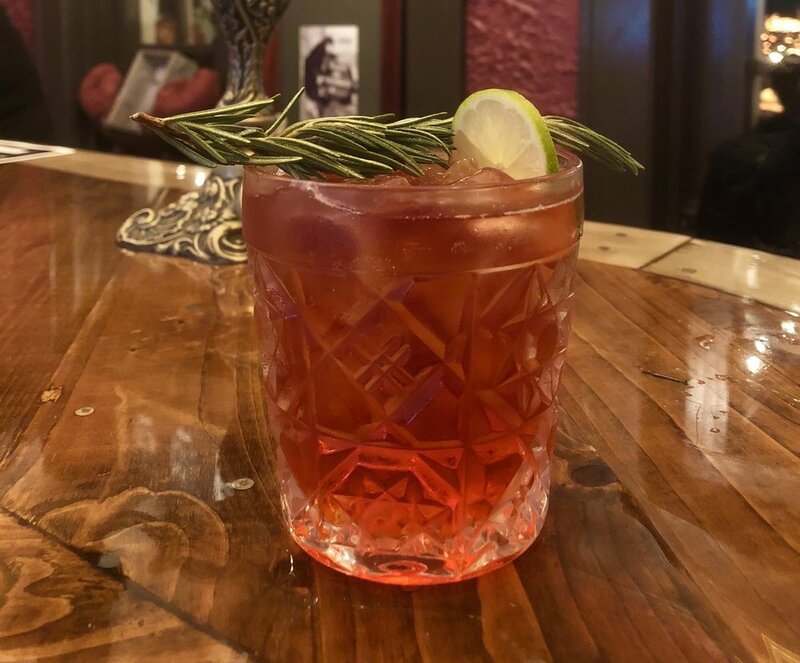 Death or Glory, will feature a red and green specialty cocktail called 'Tis the Season, to benefit Feeding South Florida. The week of November 12, Death or Glory will team up with Simple Vodka and for every specialty cocktail sold, will donate $4 to Feeding South Florida. Every $25 delivers a Thanksgiving dinner to a family of four in need. Death or Glory is located in the historic Falcon House, which was originally built in 1925. Its name was derived from the battle cry motto of the Queen’s Royal Lancers and made popular in the 1979 song “Death or Glory” by The Clash. Its canopied, outdoor Tiki Bar is a is a popular hangout for the Delray Beach community and visitors. Nautilus South Beach brings the best of West Coast cuisine to Miami with its new $32++ Feast Hotel California Saturday Brunch menu, which features staples made with fresh ingredients and multicultural flavors the region is known for. For the Mexican breakfast lovers, entrée choices range from Blue Corn Tortilla Soup with avocado pico de gallo; Chimichangas with chicken; Mexican adobo and avocado crema; Poached Eggs; Chorizo and Potato Quiche with cheddar; Huevos Rancheros with roasted tomato, peppers and tostadas; and Skinny Scrambled Eggs with egg whites, kale, tomatoes and queso fresco. For the healthy vegetarians, offerings of Roasted Root Vegetable Salad with arugula, pistachio and golden raisins; Market Green Salad with tomatoes, carrots, cucumber and radicchio; Three BeanSalad with queso fresco and cilantro; and a Quinoa Station to build your own with toppings like tomatoes, corn, onion, radishes, green beans, dried peaches, arugula, chicken, steak and shrimp. Finish your meal with a sweet finale with the Dessert Station and Bread & Pastry Station. Breakfast Danish options such as the chocolate croissants, donuts, blueberry muffins, plain croissant, sour dough, baguettes, and olive focaccias, accompanied by muesli jars or fresh berries. For the sweet tooth, Tres Leches, Fruit Tarts, Chocolate Cakes, Churros and Dulce de Leches. Burger lovers rejoice. The eighth edition of Burgerliscious will take place on Thursday, November 8th; same time (6 PM – 10 PM), same place (Fred B. Hartnett / Ponce Circle Park, 2800 Ponce de Leon Boulevard), same amazing event! More than twenty restaurants will go head-to-head as they compete for this year’s ‘Best in Bun’ and ‘People’s Choice’ Awards… the bragging rights are HUGE! A crowd favorite, Pincho Factory, returns to #Burgerliscious8. Stealing the show in 2015, 2016 AND 2017, Pincho Factory will turn up the heat as they prepare to wow our judges for a fourth consecutive year! Other restaurants that’ll be dishing out their meatiest masterpieces are newcomers 109 Burger Joint, Bocas House Coral Gables, Carolina Ale House, Clutch Burger, DUNE Oceanfront Burger & Lounge and Mighty Spark Food Co. Sink your teeth into tried and true fiery fare from BULLA Gastrobar, Café at Books & Books, Doctors Hospital – Sunrise Café, HOUSE Kitchen & Bar, Jr’s Gourmet Burgers, Miller’s Ale House, Morton’s the Steakhouse, Off the Mile Restaurant, Pisco Y Nazca, Shula’s 347 Grill and Tarpon Bend Raw Bar & Grill. Now, the moment you’ve been waiting for –tickets. Where do you buy them? Burgeliscious.com is the spot. General Admission is $60 and gets you six burgers and two Samuel Adams beverages of your choosing. Upgrade to VIP Admission, which is $125, and you’ll get unlimited, all-you-can-eat burgers and all-you -can-drink Samuel Adams beverages. But wait, there’s more! You’ll also get exclusive access to the Jack Daniel’s VIP area, the most sizzling spot we’ve got at Burgerliscious!